Lance Dunn (10) breaks away untouched for his fourth touchdown against Montana State. 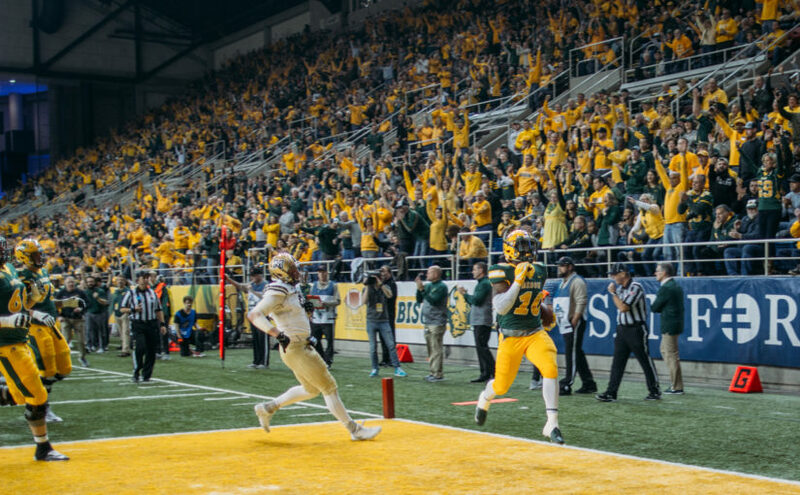 For North Dakota State running back Lance Dunn, Saturday afternoon offered a bit of déjà vu. The Waterloo, Iowa native matched a personal best from 2017 by rushing for four touchdowns. Dunn’s efforts against Montana State keyed the Bison’s thumping 52-10 victory in the second round of the FCS Playoffs. But it wasn’t just his tally that mirrored 2017’s outburst against Robert Morris; it was the efficiency with which Dunn thrashed the Bobcats’ defense. While he was unable to match his four scores on four touches against the Colonials, both Dunn and fellow running backs Bruce Anderson and Ty Brooks hit pay dirt early and often. The scoring deluge began with Dunn. After a 39-yard kick return from Ty Brooks set the table for a scoring drive, Dunn toted the ball into the end zone for six on his first touch of the day. On the ensuing drive, another lengthy return put the Bison in the driver’s seat. Robbie Grimsley took a punt return past midfield, and once again Dunn’s number was called to cap the drive. The senior took the handoff, angled left, shook a defender and scored untouched from 11-yards out. Head coach Chris Klieman envisioned that the run game would be a key aspect of the game at the outset. Because Montana State plays in the pass-happy Big Sky, the Bobcats’ defense is calibrated to defend the aerial attack. They did well in that department in 2018, but were simply not built to handle the run game a team like NDSU possesses. That is largely due to the fact that in the Bobcats’ defensive scheme, the second level of the defense does not play close to the line of scrimmage, as Klieman explained. And run the football they did, as the Herd gashed Montana State for 407 rushing yards. Later in the first quarter, Anderson got involved in the scoring party. Zack Johnson and Colin Conner opened a gaping hole in the line and Anderson obliged. With defenders positioned away from the point of attack, the senior raced away for a 32-yard score. Dunn completed the trifecta midway through the second frame from a yard out, but it was his fourth and final score that was most impressive. Proving he can score from distance as well, Dunn burst 46-yards down the middle and was once again untouched. Once again, blocking played a pivotal role. Johnson and Ben Ellefson double-teamed defensive end Tyrone Fa’anono, as Conner and Brock Robbins picked up the lead block. One more block downfield from wideout Desmond Cain, and Dunn was unscathed. “Our focus was coming off the ball, hitting them straight in the mouth and getting them moved,” right guard Luke Bacon commented afterward. Mission accomplished, Klieman agreed. “Our offensive line was dynamite today,” the fifth-year head coach stated. 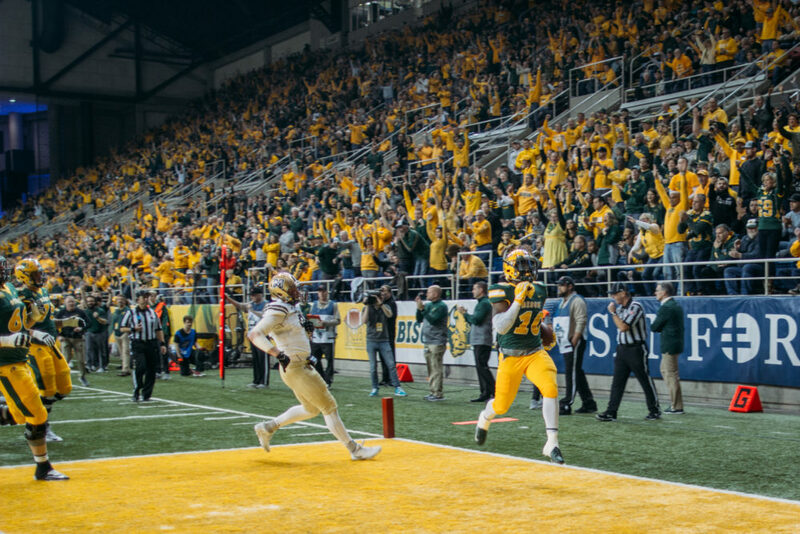 Montana State also experienced déjà vu as a result of NDSU’s ground outburst. The Bison tied a pair of program playoff records, both of which were set in Bozeman when the two teams squared off in 2010. The first came with Dunn’s fourth touchdown, which tied D.J. McNorton’s total. The next came when Brooks rushed for a 30-yard touchdown and matched the six NDSU had against the Bobcats in 2010. Adam Cofield broke that mark with a touchdown of his own, which put the finishing touches on the contest. Saturday’s win marked the first time since 1996 that NDSU had three rushers record over 100 yards. Dunn led the charge with 127. Anderson and Brooks were not too far off with 118 and 103, respectively. The Bison’s three-headed monster was economical as well, rushing an average of 12.6 yards on 30 carries. Opponents — starting with Colgate next Saturday at 11 a.m. — will now have a full complement of running backs with which to contend. Add an unleashed Seth Wilson to that list, and the ground game will keep opposing defensive coordinators awake at night. Wilson, who made his lone appearance of the season against Missouri State, can play the rest of the playoffs without concern of losing his redshirt. “I don’t think (Easton Stick) had 100 passing yards today,” Bacon remarked. “Which is great. We’d rather run the ball anyway.” With a wealth of options in the backfield, NDSU will keep doing just that.